The Composite product type is ideal for offering dynamic product kits made up of multiple components, such as custom computers, skateboards, gift-boxes and made-to-order jewellery. The powerful Composite type makes building even the most complex product kit a breeze: To create a new Composite product, just add a few components, populate them with product options and adjust their layout. Composite products can be fine-tuned to optimize the customer experience in a wide range of applications: From adding a few products in a small bundle, to crafting a complex product kit builder with countless product options, the extension gives you all the bundling functionality and layout options you need to keep your customers engaged and maximize conversion. The Composite Products extension is suitable for creating advanced product kits with dynamic, configurableproduct content. The product kits created with Composite Products consist of multiple components, with each component offering customers an assortment of product options to choose from. 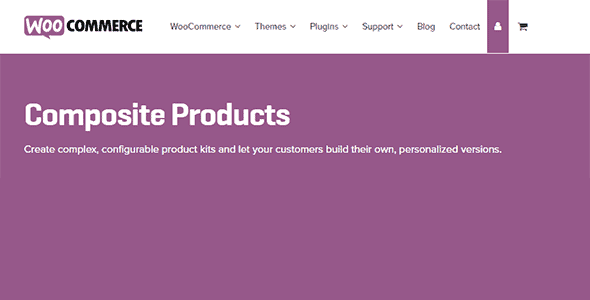 If you want to create product packages with a relatively static product content, then consider using the Product Bundles extension, which is easier to work with. WooCommerce provides even more ways to sell products in bundles, such as Grouped Products, Chained Products and Force Sells: Before deciding which is best for your particular application, it is advised to study all available documentation and always keep an eye out for new extension features.